Here at The Scrub, we offer grooming products to pamper your dog from head to tail. That's why in addition to our variety of shampoos, conditioners, and colognes, we also offer John Paul Pet brand wipes for ears and eyes, and teeth and gums. 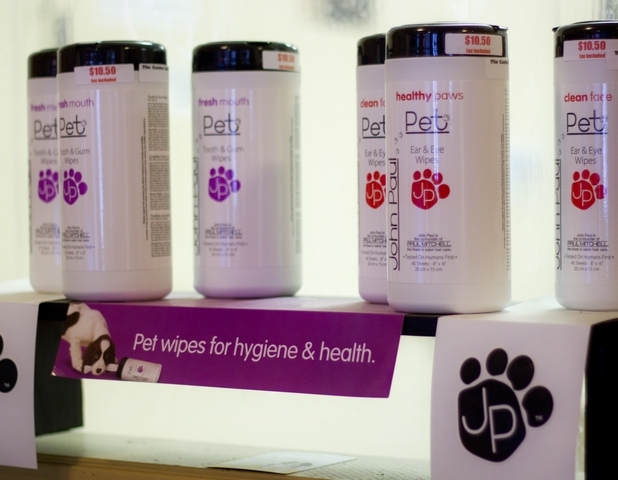 John Paul Pet products are pH balanced so that even pets with the most sensitive skin won't experience irritation. The company ensures the safety of their products by testing them on humans first, and works to support various animal rescues and programs. These ear and eye wipes are specially designed to fight the buildup in and around your dog's ears and eyes caused by tear stains, dirt, and earwax. A three-fold formula that includes sodium chloride (salt water), astringent, and aloe vera gel cleans, treats, and soothes affected areas. Just like humans, clean teeth and gums are important for your dog. Between your dog's professional dental exam and cleaning, help to further prevent periodontal disease by using these handy wipes. Made using an effective sodium bicarbonate (baking soda) formula, these wipes have a fresh mint flavor that your dog will enjoy and you'll appreciate.